If you've noticed that your Jack Daniel's is carrying a little less kick these days, you're probably right. The famed "sippin' whiskey," which advertises a recipe traced back to the nation's first registered distillery, has lowered the alcohol content of its flagship brand, Old No.7 Black Label. The whiskey now registers 80 proof, instead of 86 (or 40 percent alcohol versus 43 percent), and some drinkers feel betrayed. "You can't screw with a legend like that and get away with it," said Frank Kelly Rich, editor of Modern Drunkard magazine. "I'm sure Jack is spinning in his grave." The company says the switch was made because most customers prefer the less potent mix, which was marketed first in a few states and some overseas markets. The transition was completed earlier this year. Those who want a stiffer drink can buy specialty versions like Jack Daniel's Single Barrel at 94 proof, the company said. "We were just doing what we think most of our friends and customers wanted," said Roger Brashears, who has worked at Jack Daniel's in Lynchburg since the 1960s. "Our quality control is very scientific. It comes down to how it tastes." The company touts Old No. 7 as "a simple reminder that some things just never change. And shouldn't. This is the old-time whiskey made as our fathers made it." The uproar was started by a few whiskey drinkers who think Jack should stick to that promise. An online petition asking the company to switch back has gathered about 700 signatures. "If that's what the people wanted, they would have announced it in an ad — 'Look we lowered the proof for you,'" said Rich, who calls his magazine "the voice of the recreational drinker." Rich said the company pushed the change through without any fanfare and whiskey drinkers are just now picking up on it, saying it tastes sweeter and doesn't pack the same punch. Jack Daniel's gets to 80 proof by adding a little more water to the raw whiskey that comes out of barrels after four years at roughly 125 proof, Brashears said. "I can't tell the difference," he said. "We haven't done anything to affect the quality that has made us so many friends over the years." It is not the first time drinkers have felt burned by Jack. Roughly 17 years ago, the company lowered the proof of its famed whiskey from 90 to 86. Enough is enough, says Rich. "I've switched to Maker's Mark since," he said. "I used to drink a bottle a week. Some of our board members drink three bottles a week. Once this gets out, it will be like the New Coke thing — they'll have to bring it back." Competitors also jumped on Jack Daniel's. Kentucky's Jim Beam noted they have no plans to lower the alcohol content of their 210-year-old recipe. "I think it's interesting that our primary competitor says they've been true to their roots yet they've lowered their proof and altered their recipe," said Dave Racicot, senior director of global marketing for the Kentucky whiskey. The whiskey recipe is still the same, including four years of aging in wood barrels. Old No. 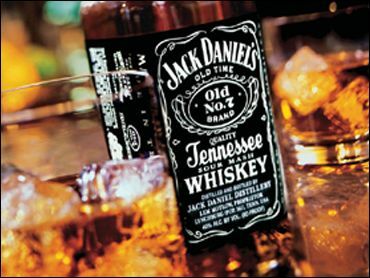 7, which Jack Daniel's says is the country's most popular whiskey with 7 million cases shipped last year, continues to sell well. It is closing in on Johnnie Walker Black Label scotch whisky as the world's No. 1 seller, said Phil Lynch, spokesman for Brown-Forman, the Louisville, Ky.-based company that owns Jack Daniel's. Lynch said the company uses the same ingredients and time-honored process it always has — including the charcoal filtering that makes Tennessee whiskey different than Kentucky bourbon. Rich said the company was saving money by adding more water, but Jack Daniel's said any savings were canceled by the expense of having to change its labels. "We don't think it's appropriate to have a magazine called Modern Drunkard dictate how we make our whiskey," Lynch said.